These are some mercury starved F32T8 lamps in a bookstore in my area. These are just two of many fixtures in this store suffering from this disease. The bookcases in the back have single lamp F30T12 magnetic fixtures that all burn brightly with the exception of a few that died from normal EOL i. e. not mercury starvation. These lamps are not altos but GE Ecoluxes. I’ve never seen a full wattage F40T12 eco or alto go mercury starved. Maybe T12 lamps can still have more mercury and still be eco or alto. Or maybe the ballast makes a difference (rapid start magnetic vs high frequency electronic instant start). I have a couple of magnetic rapid start F32T8 fixtures under the screened in porch. On a good note, LEDisease has not been detected here...yet. This looks suspiciously like a Barnes & Noble? Mar 09, 2019 at 10:53 PM Author: Cole D.
To me it looks like a Books a Million from the decor on the walls. Plus the one here uses these parabolic troffers as well. 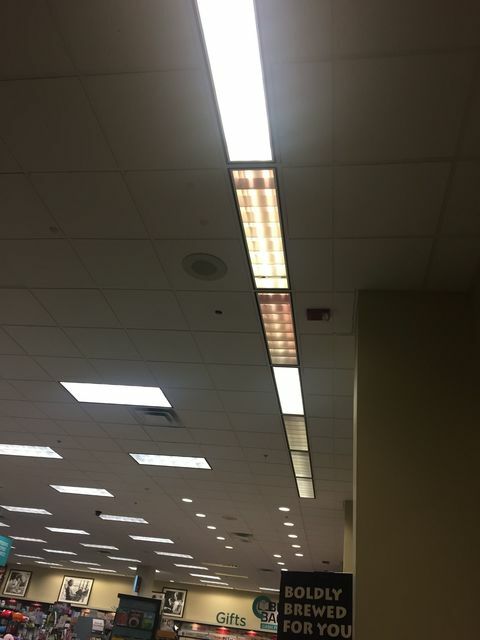 My local Barnes and Nobles still uses 2 X 2 troffers with theee individual long slim fluorescent bulbs. June 2006 alto T12 would go mercury starved in 2 or 3 months. Oddly enough there are some I installed in a tanning salon that still burn, rather dimly of course. The salon owner likes them that way. The alto U bend lamps of that time also were very prone to go mercury starved. Ambience/low level lighting I guess?